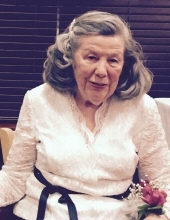 Helen M. Gallagher, 91, devoted wife and mother and longtime resident of Naperville, died Saturday, Jan. 19, at the Smith Village senior home in Chicago. She was preceded in death by her husband, John, who died in December and with whom she recently celebrated 72 years of marriage. Born Helen Connolly on Feb. 11, 1927, Mrs. Gallagher grew up in the Forest Hills section of Queens, New York, as one of five girls in her family. She met John in 1945 when both were working for General Motors Corp. in New York. Married in 1946, she and John raised five children – Helen, John, James, Virginia, and Thomas – and had eight grandchildren and two great-grandchildren. As John’s career with GM took the family to several new homes over the years, including New Jersey, Portland, Ore., suburban Chicago, Dallas, Texas, and Pittsburgh, and finally back to Naperville, Mrs. Gallagher served as the anchor and rock of the family, renown for her old family recipe for spaghetti sauce and for her optimism and kindness even during challenging times. As her children grew older, Mrs. Gallagher took up painting and produced dozens of landscapes and portraits. She and John also became residential real estate brokers in Naperville and helped sell dozens of homes in the community over many years. Visitation will be Friday, January 25 from 9:-10:30 AM at Friedrich-Jones Funeral Home & Cremation Services 44 S. Mill St. Naperville, IL 60540. A Mass of Christian Burial will follow at 11:00 AM at St. Peter and Paul Church 36 N Ellsworth St. Naperville. Interment will follow at Ss. Peter & Paul Cemetery, Naperville. In lieu of flowers or contributions, the family urges everyone to do or say a kind deed or word in her memory, as she would have wished. To send flowers or a remembrance gift to the family of Helen M. Gallagher, please visit our Tribute Store. "Email Address" would like to share the life celebration of Helen M. Gallagher. Click on the "link" to go to share a favorite memory or leave a condolence message for the family.